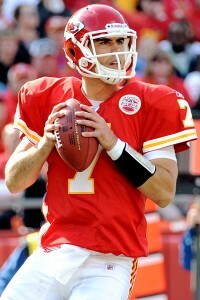 On February 28, 2009 the New England Patriots traded QB Matt Cassel and LB Mike Vrabel to the Kansas City Chiefs for a second-round pick in the upcoming NFL draft. Cassel, an unknown backup prior to 2008, had distinguished himself when he filled in for star QB Tom Brady, who was lost for the year with a knee injury in the season-opening contest. The trade reflected the interest that Cassel had drawn as a result but also New England Head Coach Bill Belichick’s confidence that Brady, whose injury had been further complicated by an infection following surgery, would be fully recovered and ready to resume his starting role. Prior to 2008, Cassel had not started a game since his senior year in high school in 1999, serving as a reserve during college at USC behind Heisman Trophy winners Carson Palmer and Matt Leinart before being chosen by the Patriots in the seventh round of the 2005 NFL draft. He threw a total of just 39 passes in three seasons, for 253 yards and two touchdowns. With a strong arm, intelligence, and good leadership qualities (refined by quality coaching), Cassel steadily improved over the course of the 2008 season as he threw for 3693 yards and 21 touchdowns while giving up just 11 interceptions. The Patriots, a year removed from a 16-0 regular season that fell short of ultimate perfection in the Super Bowl, barely missed the playoffs with an 11-5 tally. They initially used the franchise tag on Cassel before dealing him. Upon being traded to Kansas City, who had a new general manager in Scott Pioli, formerly in charge of player personnel with the Patriots, and a new head coach, Todd Haley, Cassel was immediately named the starter over QB Tyler Thigpen. The Chiefs were coming off of two straight losing seasons under the previous head coach, Herman Edwards, including a miserable 2-14 record in 2008. The offense had been adjusted from one that was run-oriented to a spread that allowed Thigpen to operate exclusively out of the shotgun. While he showed talent, he also had limitations and the team won only one of the games he started. Kansas City marginally improved to 4-12 with Cassel behind center in ’09. He took a pounding behind a mediocre line (he was sacked 42 times) and threw for 2924 yards with 16 TDs and 16 interceptions, resulting in a 69.9 passer rating. RB Jamaal Charles came on in the second half of the year to upgrade the ground game but it took the acquisition of WR Chris Chambers, who had been waived by the Chargers and appeared in the last nine games, to give Cassel a reliable target. Things got much better for both Cassel and the Chiefs in 2010, albeit helped along by a weak schedule. Cassel showed better judgment and took fewer sacks while passing for 3116 yards and 27 touchdowns against just 7 interceptions, for a passer rating of 93.0. He was named to the Pro Bowl, as were Jamaal Charles, who rushed for 1467 yards and caught 45 passes for 468 more yards, and WR Dwayne Bowe, with 72 receptions for 1162 yards and 15 TDs. Kansas City topped the AFC West with a 10-6 record and lost decisively to the Ravens in the Wild Card playoff round. The Chiefs started off the 2011 season by being blown out in their first two games by a combined score of 89-10 and, while they finished with three wins in the last five games, they ended up back under .500 with a 7-9 record. The team had problems with injuries and Coach Haley was gone before season’s end. Cassel was on injured reserve after suffering a broken hand in the ninth game and he ended up passing for 1713 yards and 10 touchdowns with nine interceptions. Charles had gone down with an ACL injury in the second week and, while Bowe was still a capable receiver, his touchdowns dropped from 15 to five with the underperforming, patchwork offense. Cassel’s hand injury required surgery but he was back in 2012. However, he was inconsistent and turnover-prone, provoking negative fan reaction, and, following a head injury, was consigned to the bench in favor of Brady Quinn. Playing in a total of nine games, Cassel threw for 1796 yards and six touchdowns while giving up 12 interceptions. The team dropped to 2-14 and, with wholesale changes occurring afterward, Cassel was released in the offseason. Overall, in four seasons with the Chiefs, Cassel completed 854 of 1489 passes (57.4 %) for 9549 yards and 59 TDs with 44 interceptions for an overall rating of 77.5. He was sacked 109 times and the club went 19-28 in his starts, with one winning season out of the four. An effective game manager at his best, Cassel also displayed both class and toughness with an organization that was experiencing turmoil while he was there (for instance, there was a different offensive coordinator in each of Cassel’s four seasons). He moved on to the Minnesota Vikings, where he returned to a primarily backup role. As to the other players involved in the trade with New England, Mike Vrabel, who turned 34 prior to the 2009 season, was expected to improve the pass rush from the outside linebacker position. While he was on the downside of his career and had lost a step, he also was a savvy player with excellent instincts. He provided the leadership that was expected, although he also continued to show signs of decline and his career ended after two seasons. The second-round draft pick that the Patriots received from the Chiefs was used to take safety Patrick Chung out of Oregon, who spent four years with the club, went to Philadelphia for a year in 2013, and returned to New England in ’14.